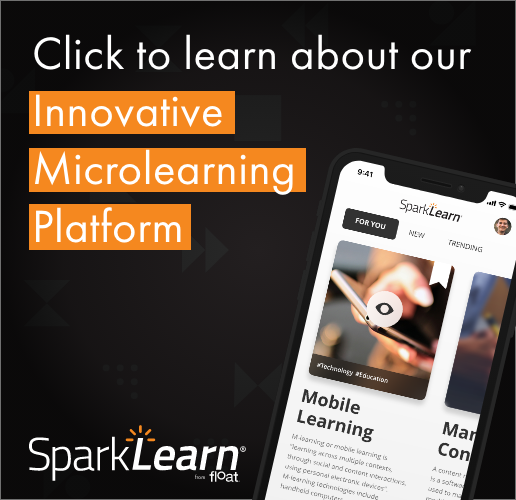 Morton, IL JUNE 20, 2017 – Float has released SparkLearn™, a microlearning platform that allows for easy publishing and viewing of learning content, including courses and resource documents. The platform can import content – such as courses, documents, presentations, and more – that has been developed with tools like Office, Acrobat, Adapt, Articulate Rise, Captivate, and other responsive development tools as easily as updating a blog post. The LCMS interface is also flexible enough to support content created directly in the system. All activity in the user app is tracked with the industry standard Experience API (xAPI). Other analytics tools, such as Google Analytics, Flurry, or Adobe Analytics are also a snap to plug into the system. Float representatives will be providing in-person demonstrations throughout the FocusOn Conference, June 20-22 in San Diego, California. To learn more about SparkLearn, visit Float at booth 210.